There is a sense throughout the castle of it being more of a lavish home than a hotel, with individually designed bedrooms, each with generously sized bathrooms and exceptional views. 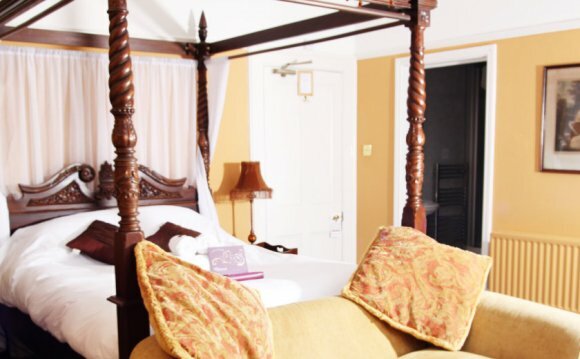 Needless to say, the standards of service are excellent – discreet but far from stuffy, and the hotel has enjoyed wide acclaim and many awards in recognition of this. Guests particularly enjoy the relaxed environment, and with the 200 acres of parkland surrounding the hotel, one can very quickly leave all worldly cares and worries behind. It’s the perfect romantic retreat. The location, close to the pretty market town of Masham and only 15 minutes from the A1, is deceptively convenient. The Cunliffe-Lister family also run the surrounding 20, 000 acre Swinton Estate, and this is one of the many attractions that sets Swinton Park apart from other country house hotels. The Estate stretches from the River Ure in Wensleydale up onto the moorland dales and hotel guests have access to a whole host of country pursuits that include fishing, golf, falconry, riding and shooting. The Yorkshire Dales scenery is outstanding, and there are many popular spots within a walk or a short drive. Swinton Bivouac is located on the Estate, just two miles from Swinton Park, close to the Druid’s Temple – a gothic ‘folly’ in the woods. Swinton Bivouac offers luxury camping in yurts and woodland shacks, along with a stylish café and shop. Swinton Park’s commitment to cutting food miles and carbon emissions and reducing power consumption, following the restoration of its walled garden, the installation of a carbon-neutral wood-chip boiler and an eco-friendly laundry, has been recognised at a national level.